Throughout the decades in which he served as crew chief for the Wood Brothers race team, Leonard Wood was known for being able to take his machine tools and solve most any problem and create some innovative components as well. It was that same approach to problem solving that led Wood to build one of the most tricked-out lawn mowers ever to snip a blade of grass. 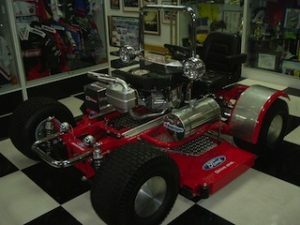 He’s also built an even fancier one for his brother Glen Wood, and it’s on display in the Wood Brothers Museum in Stuart, Va. Not surprisingly, both mowers carry the same paint scheme as the Motorcraft/Quick Lane Ford Fusions that the team fields for Trevor Bayne on NASCAR’s Sprint Cup Series. Leonard’s mower can be seen in Stuart as well – when he’s mowing his front lawn. The lawn mowers are the solution to the problems Wood used to experience mowing a steep slope on his property. He said it’s the same approach he used when preparing the No. 21 Fords and Mercuries that many of the sport’s greatest drivers steered to Victory Lane 98 times since 1950. “In racing, when you’ve got a problem, you think about how to fix it and what can you do to make things easier,” he said. What he came up with to solve his mowing problem rivaled some of his handiwork on race cars and pit equipment. 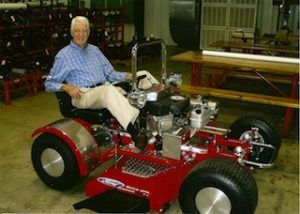 Seeing the mower in operation, Glen Wood decided he wanted one of his own, and Leonard put even more innovations on the second one. The Leonard Wood lawn mowers definitely have a motorsports look to them. The updated version of Leonard’s mower has an Indy-car like nose on it. Both have big tires, roll bars and chrome bumpers. Even the suspension components are like miniature versions of those found on Cup cars. Wood said that other than the engines, none of the components are from regular lawn mowers. “I just visualized what it was going to look like and what I wanted, and I just went and made it,” he said. “I didn’t make any drawings or anything. I got the material, sawed it out and welded it together. Unlike his race cars, Wood’s lawn mowers aren’t known for setting speed records. “You don’t want a lawn mower running fast,” he said. But the subject of getting speed from them has come up. A state trooper who had seen Wood’s mower in operation wanted him to prepare it for a speed run at the Bonneville Salt Flats. Wood decided to hold off on a Bonneville run. Instead, he gets his satisfaction from just mowing the grass and watching his creation perform just as he designed it. “When you go over a bump, you can see the tire going up and down while the vehicle remains level,” he said. “It’s neat to see the A-frames and the suspension working.